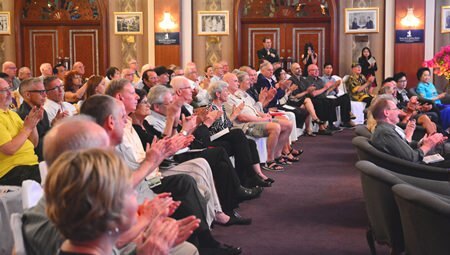 Enthusiastic concert-goers gathered recently at the Royal Cliff Beach Hotel for an evening of romantic songs from opera and musicals. The event, titled ‘Music of Love and Devotion’ celebrated the 70th anniversary of His Majesty the King’s accession to the throne and was a joint presentation by the Royal Cliff Hotels Group and Grand Opera (Thailand). The concert was directed by Stefan Sanchez, Artistic Director of both the European Chamber Opera and Grand Opera (Thailand). He formed the Thai opera company in 2012 and it operates throughout Southeast Asia, aiming to provide voice training for young local singers and prepare them for international careers. The company has already produced over a hundred concerts in Thailand, Singapore, Myanmar, Bahrain, India and South Korea. For the fourth year running, the company presented a concert in the imposing Head of State Chamber where a delightful stage area had been created, illuminated by professional theatre lighting. And in case you’re wondering, the expression “grand opera” as distinct from merely “opera” appeared during the nineteenth century when there was a taste for large historical operas with a huge cast and orchestra, along with lavish design and spectacular stage effects. Invariably, many extras would be hired to provide a chorus. The concert opened with a stirring performance of the Royal Thai Anthem and was followed by the famous waltz and drinking song from Verdi’s La Traviata. This was a splendid opening number and given a lively performance by the entire ensemble. There was a fascinating selection of solo performances including the aria Endless pleasure, endless love from Handel’s opera Semele given by soprano Chalisar Jongcharoenchaikul (Bell) who impressed with her command of high notes. Baritone Stefan Sanchez gave an assured and dramatic performance of an aria from Donizetti’s Don Pasquale and soprano Nattida Gumchai (Pang) sang the lovely waltz Je Veux Vivre from Gounod’s Roméo at Juniette. She has compelling stage presence and confidence in the upper range and was provided with a sympathetic piano accompaniment from the company’s regular pianist, Morakot Cherdchoo-ngarm who worked diligently throughout the concert in his usual unassuming and professional manner. Saran Senavinin (Rain) has a light baritone voice and he sang a Bellini aria from I Puritani with good projection and secure intonation with some lovely vocal tone in the quieter passages. Tenor Kittiphong Klabprathum (Ohm) gave a charming performance of the short Spanish classical song Del cabello más sutil and later gave a moving performance of Why, God, Why from Miss Saigon. It was a pleasure to hear the spot-on intonation and purity of tone from countertenor Potprecha Cholvijarn (Jak) in his performance of a canzonet by Haydn. He has splendid vocal control, good phrasing and a really focused tone quality especially in the quieter passages. His performance of Mozart’s Dans un bois solitaire was equally compelling in which he brought out the drama of the song, his bell-like high notes being especially telling. Ittinat Seeboonruang provided a competent reading of Erstarrung from Schubert’s song cycle Winterreise as well as an attractive performance of Wagner’s well-known O du, mein holder Abendstern from Tannhäuser. Ittinat has clear diction, a confident style and a pleasingly relaxed tone quality. Highlights of the concert included Puccini’s popular Vissi d’arte from Tosca sung by soprano Pimluck Vessawasdi (Mai). She gave an impassioned yet beautifully controlled performance and really brought a sense of operatic magic to the aria. Stefan was equally compelling in the aria Cortigiani, vil razza dannata from Rigoletto and his rich, powerful voice and confident audience contact revealed his years of operatic experience. The second half of the programme opened with scenes from Mozart’s Don Giovanni featuring seven members of the company. It opened with a compelling performance from bass-baritone Pichaya Kemasingki (Pub) who played Leporello. The well-known duet Là ci darem la mano was given a lovely performance by Chalisar and Saran and there was some commendable solo work from Chalisar who played Zerlina. With splendid ensemble singing and convincing interaction between the characters, this was another highlight of the evening. The remainder of the programme consisted of popular songs, opening with Jak’s moving performance of Danny Boy. As usual, the intonation was perfect and sung with finely-judged vibrato. There was excellent voice-blending in Nattida and Pichaya’s duet Sun and Moon from Miss Saigon and a delightfully innocent performance of the Guys and Dolls song, I’ve Never Been in Love Before sung by Saran and Nattida. I enjoyed Ittinat’s clear diction and confident singing of On the Street Where you Live but one of the highlights was Pimluck’s exceptional performance of the lovely song With You, from Ghost The Musical. The programme concluded with a moving performance of The Prayer, a song made famous by Celine Dion and Andrea Bocelli. Sung by Nattida and Saran, it made a beautiful ending to the programme. In complete contrast, the encore number was the jolly Neapolitan song Funiculì, Funiculà composed in 1880 to commemorate the opening of the first funicular cable car on Mount Vesuvius. It was sung by the entire company and made a delightful conclusion to a memorable evening of song.